As he was jumping over a log, a man sprang up from behind and gave him a heavy blow with a gun. Joseph turned around and knocked him to the ground, and then ran at the top of his speed. About half a mile further, he was attacked again in precisely the same way. He soon brought this one down also and ran on again, but before he got home, he was accosted the third time with a severe stroke with a gun." Joseph struck this third and final attacker with such force that he dislocated his own thumb. He continued running, "being closely pursued until he came near his father's house," at which time his assailants, "for fear of being detected," broke off the chase. Reaching a fence corner, he "threw himself down … to recover his breath," then rose and continued running until he reached the house. For devout LDS members, the mortal risks Joseph took to safeguard the gold plates confirm their divine origin. The above account, like other contemporary accounts, emphasizes Joseph's speed, strength, and resilience, as well as his deep devotion to protecting the plates God had entrusted him with. These admirable qualities concur with Joseph's special role as prophet of the true church. Critics point out several potentially troubling aspects concerning these accounts' material circumstances. While historians disagree about the precise weight of the tablets, for example, all accept that a set of metal-based plates consistent with contemporary descriptions would have weighed about 50 pounds. In addition, the historical record shows that Joseph Smith suffered a childhood illness that compromised his mobility as an adult. Joseph never claimed that divine intervention had enabled him to evade harm during these pursuits. So how could he have run almost two miles through difficult terrain and defended himself against violent assailants while carrying 50 pounds of added weight? "Take Heed Continually": Protecting the Gold Plates By Andrew H. Hedges. Ensign, January 2001. Available Link is here. "The surgery was successful, although Joseph walked the next several years with crutches and showed signs of a slight limp the rest of his life." "The Life and Ministry of Joseph Smith," Teachings of Presidents of the Church: Joseph Smith, (2007), p xxii Available: Link is here. If we believe the account as told by the prophet's mother as factual (as we were all taught in various gospel doctrine classes), then some obvious problems arise. How could any man, especially a man who had a slight limp run with a 50 pound weight and avoid capture by three assailants? The journey through the woods was about 3 miles as Joseph indicated above. It's inconceivable that anybody could run carrying a 50 lb. set of metal plates, jumping over logs and such and be able to outrun three men for some 1 to 2 miles that were bent on taking the plates from Joseph. And all this from a young man that had a slight limp and would have difficulty running at a high speed for a long distance - especially carrying a 50 lb. weight. We've heard where a football coach tried this experiment to prove that it could be done, however he only used a 20 lb weight and was only marginally successful for a limited distance. There's a big difference between a 20 lb. weight and a 50 lb. weight. We can guarantee that if you got any normal, healthy, even stronger than average young man as Joseph reportedly was (and even one with healthy legs where there was no limp at all) and had him carry a 50 lb. dumbbell, even just one mile, that virtually any three men pursuing him could catch him almost immediately. Recently, several students tried this experiment with a 50 lb. plate. It was very easy to catch the person running with the weight. They put their experiment on youtube here. Joseph did not claim any superhuman strength divinely bestowed upon him for the occasion nor any angelic help, so how could this have happened? If we accept this account, as we've been taught in church as factual, then It seems obvious to all but the truly faithful that there's something wrong with this story reportedly told by Joseph. Although this story isn't that significant to Mormon history, there's an old saying "if you can't believe someone about the little things, how can you believe the big ones?" 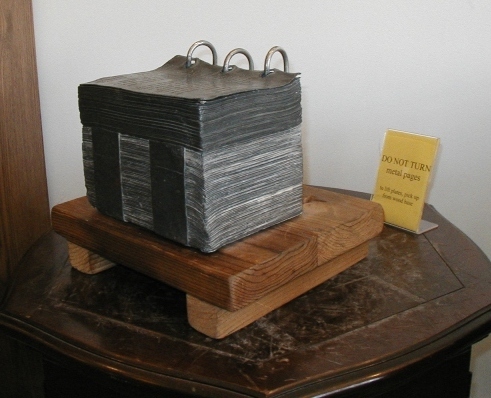 Critics of the church often use the weight of the plates as evidence that the Book of Mormon story is not true. They go through complex calculations to show how gold plates with the dimensions described by the witnesses must have weighed some 200 pounds. At the Tanner's Bookstore in Salt Lake City, they actually have constructed a replica of the gold plates using lead which is actually lighter than gold. They challenge patrons to try to lift and carry the plates around the room. The critics say that Joseph could not have possibly transported and worked with these heavy 200 pound plates. Also pure gold would be too malleable to be useful for permanent engraving. In this instance we disagree with the critics' premise. We don't feel that the plates had to be made of solid gold. Although the plates are often referred to as 'gold plates' they didn't necessary have to be made of pure gold. The witnesses described them as having the 'appearance of gold'. Although Joseph originally said "there was a book deposited, written upon gold plates" (History of the Church, vol. 1, by Joseph Smith, pp. 11-12), Joseph later wrote to John Wentworth that the plates had "the appearance of gold": "These records were engraven on plates which had the appearance of gold. (History of the Church, vol. 4, p. 537). Many things could account for this such as an alloy of gold and another metal or even polished copper plates. A gold alloy or polished copper or even painted tin would have the appearance of gold yet weigh much less. Editor Comment: We do however, wonder why the angel would give Joseph specific instruction that he could not use the plates for personal gain if they were not made of gold. Using calculations to arrive at the plates is unnecessary as many of the witnesses have given their estimates as to the weight of the plates by lifting the container that held the plates which several people claim to have done. William Smith, a brother of the Prophet who had handled and hefted the plates in a pillow-case, claimed on several occasions that the set of plates weighed about sixty pounds. (Robert F. Smith, The 'Golden' Plates, pp 276 Reexploring the Book of Mormon, ed., John W. Welch ( Salt Lake City: Deseret Book and FARMS, 1992). Joseph's brother William: "I did not see them uncovered, but I handled them and hefted them while wrapped in a tow frock and judged them to have weighed about sixty pounds.…Father and my brother Samuel saw them as I did while in the frock. So did Hyrum and others of the family." (Zion's Ensign, p. 6, January 13, 1894). "I was permitted to lift them... . They weighed about sixty pounds according to the best of my judgement." -William Smith� William Smith, William Smith on Mormonism (Lamoni, Iowa: Herald Steam, 1883), 12. "I…judged them to have weighed about sixty pounds. "-William Smith�� William Smith interview with E. C. Briggs. Originally written by J. W. Peterson for Zions Ensign ( Independence, Mo. ); reprinted in Deseret Evening News, 20 January 1894, 11. "They were much heavier than a stone, and very much heavier than wood... . As near as I could tell, about sixty pounds." -William Smith���� William Smith interview, The Saints' Herald, 4 October 1884, 644. "weighing altogether from forty to sixty lbs." -Martin Harris� Martin Harris interview, Iowa State Register, August 1870, as quoted in Milton V. Backman Jr., Eyewitness Accounts of the Restoration (Salt Lake City: Deseret Book, 1986), 226. "I hefted the plates, and I knew from the heft that they were lead or gold." -Martin Harris�� "Interview with Martin Harris," Tiffany's Monthly, May 1859, 169. Joseph's sister Catherine, while she was dusting in the room where he had been translating, "hefted those plates [which were covered with a cloth] and found them very heavy." -H. S. Salisbury, paraphrasing Catherine Smith Salisbury �����I. B. Bell interview with H. S. Salisbury (grandson of Catherine Smith Salisbury), Historical Department Archives, the Church of Jesus Christ of Latter-day Saints. Willard Chase reportedly also said the plates weighed 50 or 60 pounds but we haven't yet been able to locate the exact quote.�� Robert F. , "The 'Golden' Plates," Reexploring the Book of Mormon, ed., John W. Welch (Salt Lake City: Deseret Book and FARMS, 1992). So using the statements of the witnesses, it seems logical that the plates weighed about 50 pounds give or take 10 pounds. We summarily reject the critics' arguments that the plates must have weighed 200 pounds. Evidence of the Prophet's extraordinary character emerged early in his life. The Smiths were living in West Lebanon, New Hampshire, when a deadly epidemic of typhoid fever attacked many in the community, including all the Smith children. While the other children recovered without complication, Joseph, who was about seven years old, developed a serious infection in his left leg. Dr. Nathan Smith of Dartmouth Medical School at nearby Hanover, New Hampshire, agreed to perform a new surgical procedure to try to save the boy's leg. As Dr. Smith and his colleagues prepared to operate, Joseph asked his mother to leave the room so she would not have to witness his suffering. Refusing liquor to dull the pain and relying only on his father's reassuring embrace, Joseph bravely endured as the surgeon bored into and chipped away part of his leg bone. The surgery was successful, although Joseph walked the next several years with crutches and showed signs of a slight limp the rest of his life. This explains why in many paintings of Joseph he is shown with a cane. One of Joseph's canes is on display at the Community of Christ Museum in the Independence Temple. After removing the plates from the stone box, Joseph hid them in a birch log until preparations could be made at home for the plates. then he went to retrieve them. "The plates were secreted about three miles from home...Joseph, on coming to them, took them from their secret place, and wrapping them in his linen frock, placed them under his arm and started for home." After proceeding a short distance, he thought it would be more safe to leave the road and go through the woods. Traveling some distance after he left the road, he came to a large windfall, and as he was jumping over a log, a man sprang up from behind it, and gave him a heavy blow with a gun. Joseph turned around and knocked him down, then ran at the top of his speed. About half a mile further he was attacked again in the same manner as before; he knocked this man down in like manner as the former, and ran on again; and before he reached home he was assaulted the third time. In striking the last one he dislocated his thumb, which, however, he did not notice until he came within sight of the house, when he threw himself down in the corner of the fence in order to recover his breath. As soon as he was able, he arose and came to the house." (Lucy Mack Smith, mother of Joseph Smith, in Biographical Sketches of Joseph Smith the Prophet, 1853, pp. 104-105; Comp. reprinted edition by Bookcraft Publishers in 1956 under the title History of Joseph Smith by His Mother, pp. 107- 108) Emphasis added. That on the 22d of September, he arose early in the morning, and took a one horse wagon, of some one that had stayed over night at their house, without leave or license; and, together with his wife, repaired to the hill which contained the book. He left his wife in the wagon, by the road, and went alone to the hill, a distance of thirty or forty rods from the road; he said he then took the book out of the ground and hid it in a tree top, and returned home. He then went to the town of Macedon to work. After about ten days, it having been suggested that some one got his book, his wife went after him; he hired a horse, and went home in the afternoon, staid long enough to drink one cup of tea, and then went for his book, found it safe, took off his frock, wrapt it round it, put it under his arm and run all the way home, a distance of about two miles. He said he should think it would weigh sixty pounds, and was sure it would weigh forty. On his return home, he said he was attacked by two men in the woods, and knocked them both down and made his escape, arrived safe and secured his treasure. -- He then observed that if it had not been for that stone, (which he acknowledged belonged to me,) he would not have obtained the book. 1) The story is basically true as told but maybe some of the details are merely exaggerated hearsay and conclusions to what actually happened are not correct. Joseph did not necessarily have to outrun the men, he could have defeated his pursuers individually and continued on his way. We don't know anything about how big, strong or determined these men may have been and Joseph, being the strong lad he was, emerged victorious. The length of the trip through the woods, and other details, may have been somewhat exaggerated and it's possible for him to eventually have journeyed through the woods with the 50 lb. plates more-or-less as described. 2) Joseph had assistance from above. God may have temporarily supplemented Joseph's strength and endurance for him to carry out his mission. It was not in God's plan to have the plates fall into enemy hands and he endowed Joseph with 'divine help' as needed. 3) Since the account is not told directly from Joseph, it is suspect. The primary account sometimes told in church comes from Joseph's mother, Lucy, reported some 15 years afterwards. His mother may have been relying on hearsay and told a yarn she likely heard and believed herself. Like so many faith-promoting stories told in church, we don't have Joseph's first-hand account recorded by him personally. But so many independent witnesses reported hearing the story that there is little doubt that Joseph told of being attacked while he was bringing the plates home. The best source is Early Mormon Documents (EMD) by Dan Vogel. EMD vol 1 includes the accounts of Orson Pratt (p. 158), Lucy Mack Smith (pp. 335-36), and Katharine Smith (pp. 524-26). EMD vol 2 includes accounts from Willard Chase (p. 71), Benjamin Saunders (pp. 137-38), and Martin Harris (pp. 306-7). As these people independently told similar stories, the source of the tale seems clear to us to have to have been Joseph himself. Since Joseph was alone in the woods (except for the alleged pursuers), how else could the story have originated in the first place if not from Joseph? Some of the details vary from the accounts. We can determine the following; Joseph was likely attacked by 2 or 3 men. Joseph journeyed some distance, perhaps as much as 3 miles through the woods carrying the gold plates that weighed some 50 pounds give or take 10 pounds and Joseph made it safely home with the plates. Now we don't know the details of what exactly happened in the attacks, how formidable his attackers were, how long he took to make it to his house and just how much nonstop running he did with the heavy plates. Intuitively upon hearing the account as described by Joseph's mother, we try to recreate the scene in our mind. I imagine one young man carrying a 50 lb. weight and some man attacking him to get the plates and the young man perhaps being able to knock him down. I then wonder would that man just give up and then walk away? And then the 2nd man attacks the young man and then walks away. And then perhaps a 3rd man attacks Joseph and merely walks away as well? Some of us have a hard time imagining a young man not getting completely exhausted traveling through the woods with such a weight, fighting off attackers and somehow still be in any sort of shape to keep his property from being taken by repeated attacks, especially after dislocating his thumb in the last attack. And what of the attackers, would they not join forces to more easily engage him or did they merely each walk away in a different direction silently and not alert the other(s)? I have to wonder how did they each know to look for Joseph in those woods in the first place at the same time yet not be together? I know if I was somehow unable to take something from a young man carrying a magnificent treasure, I would at least follow him to see what happened to the treasure. How could he possibly escape me carrying 50 lbs. of gold plates? Also, one of the men according to Lucy "gave him a heavy blow with a gun". How could a such a man with a gun not be able to be able to rob Joseph, who was unarmed, of his treasure? In the absence of details and given that this is perhaps a hearsay story with no written account by Joseph himself, no definitive conclusion can be reached as to what exactly happened to Joseph but the story, as told to us in church, seems extraordinary. If the story is but a 'tall tale', regardless of its origins, it should not be taught in church as a true, historical account, as we have been taught growing up in the church, just to provide another faith-promoting event. Otherwise, it causes credibility problems for the church by casting doubt as well on other more fundamental church narratives that are essential to the church's claims to being restored through Joseph Smith. The following very informative video by noted Mormon historian Dan Vogel describes the circumstances surrounding how Joseph first brought the plates to his family's house in 1827. In this video, Dan Vogel also recants the story mentioned above. Salt Lake Messenger No. 105.